BIS III (pare cup), eхp.? 3.12. 05-St.-Petersburg (RUS)-exp. Sokolova (RUS)-cert. CAC, BOB , BIG II exp Sokolova. 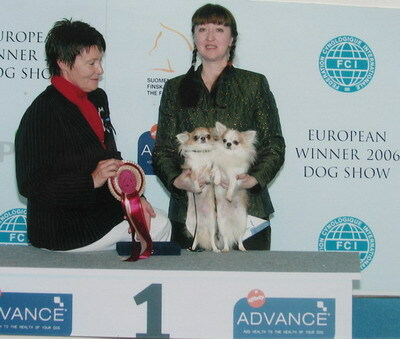 CAC, Best male, BOB, BIG II (exp. Alifirenko). 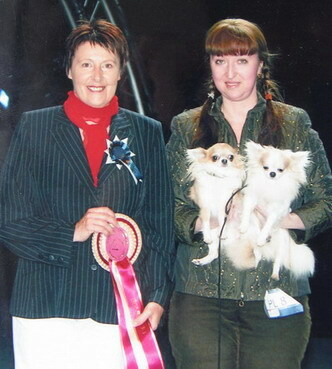 1.04.06-St.Petersburg-National Chihuahua show - 1 EX (CHAMPION CLASS)-BEST MALE, -CLUB W 2006. (exp. Hans Almgren (Sweden). 20.05.06-Viborg (Rus)-Exp. 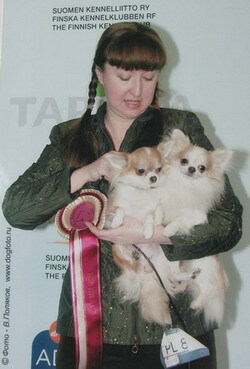 Olifirenko (RUS)-CERT CAC, Best Male, BOB.